Farmer's Market - The City of Ridgefield, Washington | Forward Thinking. Rooted in Tradition. Opening day is the FIRST SATURDAY IN MAY and runs every Saturday, 9 am to 2 pm, through the first weekend of October. Currently held at Overlook Park in historic downtown Ridgefield. The Ridgefield Farmer’s Market begins its 10th season this year! The Market is a revival of the heritage of farmer’s markets of a time long ago, where on summer weekends the freshest produce and homemade products would be would be proudly displayed on tables early in the morning before becoming a meal, a decoration, or a centerpiece in someone’s home later that same day. Vendors offer a great selection of products to choose from including local produce, plant starts, baked goods, flowers, soaps, jewelry, home décor items, clothing and more. Come down to Overlook Park to enjoy all the market has to offer. We are always looking to increase the variety of products available at the market. If you are a farmer, or you produce a local, artisanal product you would like to sell, apply today. For questions or additional information, send an email to rfm98642@aol.com. Are you a musician, or do you play in a band? Do you like to perform in public? 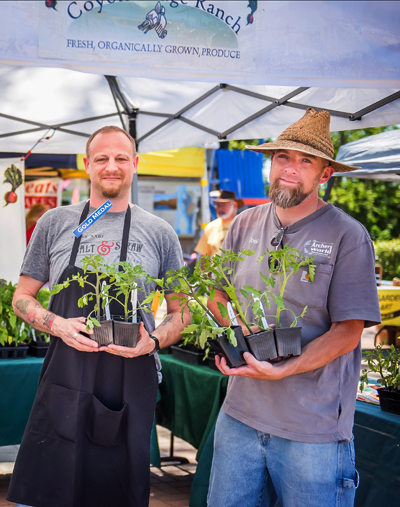 The Ridgefield Farmers Market is always looking for new groups to entertain for a couple hours each Saturday during the market season. Do you enjoy volunteering and being out in your local community? We need community minded people to help out for a couple hours each Saturday during the market season. Time commitments can vary based on your availability. If you are interested in providing entertainment or volunteering at the market we would love to hear from you. Email the market at rfm98642@aol.com.